I would like to introduce you to the Nicosia Parks. Slowly slowly, we will try to see each park with the good and the bad parts. It’s one of the oldest parks in Nicosia, very shaded, with lots of benches to relax fountains and a small playground. Being in the centre of the town can be a very good place to go just to relax in a very sunny summer or for a short walk with the stroller. It is a very green park with basketball field, playground, coffee shop and restaurant, and nice pathway for stroller and bikes for small kids. There is lot’s of shaded areas with benches to relax and green grass for a nice sun bath. This park has a picnic area, pedestrian lanes, bicycle track, children playground, a kiosk, a basketball and a football court and a car park. The pedestrian lanes and bicycle track are very good for strollers and small children with bikes and are all shaded. 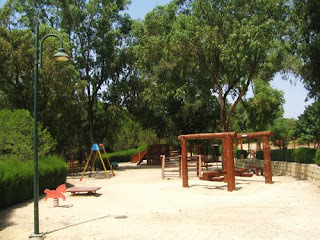 The playground is very big with lots of space for running and climbing made out of wood. It is situated south of Nicosia very close to the Mall of Nicosia and Ikea shop. The park has two picnic areas, roads, bicycle tracks, pedestrian lanes, sports grounds, parking places, an Environmental Information Centre, a bird observation point at the Athalassa Dam, botanical garden, dog walking path etc. 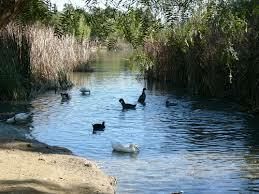 There is also a small picturesque lake with ducks and other birds. The playground is also big, build out of wood. To get there, at the Lefkosia General Hospital roundabout take the exit to Yeri. Take the second turn to the left, and you will find the parking lot at 200m on your left. It is situated right next to the Makarios III Hospital which merges with the Grounds of the famous English School which are open to the public – there are often free exhibitions, folk dancing, music, fairs and festivals in this park as there is plenty of parking both at the hospital car parks and further down the dual carriageway with access to the park of it. This park has a stadium for everybody to use with a running track, fountains, woodland walks, tennis courts, outdoor playground, kiosks, picnic areas etc. Address: near the Saint Demetrious Park at Koritsas street, between the Makarios hospital and the English School. Phone no: +357 22 318358. Is the public access bit of the Presidential Palace Gardens and grounds and it merges with the Pezodromos Linear Park which stretches for over 7 miles from the heart of the City through the Old colonial suburbs, through old Strovolos (heads just past Jumbo) and continues for several miles into Lakatamia. It has a nice small playgrounds and areas. 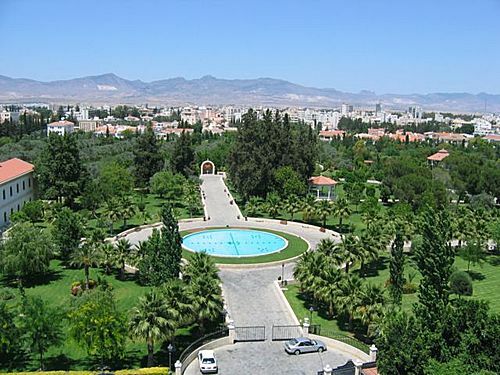 This park is also known as Engomi Park and it is opposite the European University campus. 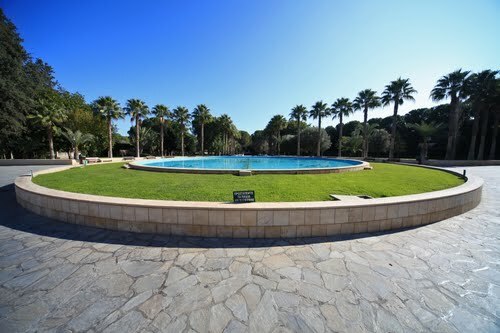 This park is maintained by the coffers of the Kykkos Archbishopric and has a menagerie parrots, swans, ducks, geese, baboons and beautiful fountain and immaculate walkways and is surrounded by ancient olive and citrus groves. Some of the streets aligning the parks can also be treated as extensions of them as they contain the billionaire’s rows and company headquarters of converted colonial mansions where people live and work in splendour within beautifully shady tree lined streets which are very interesting to wander along. For example the stretch from the Anglican Cathedral down towards the ford across the river at Podromos Park which has quite an extensive wood and children’s play area and restaurant.